The 1804 Silver Dollar is considered by many to be the “King of American Coins.” It is certainly a coin which captures attention and sparks the imagination. When one of the known examples is sold, it invariably becomes part of the world news headlines. The fifteen examples known to exist are classified into three different groups, or classes, two of which are collectable. The history of the coins is different from any other made by the United States Mint. In the first place, none were struck until 1834, and it is believed that the last examples were not made until as late as the 1870s, almost a lifetime after the date that is seen on the coins. The 1804 silver dollars are of the so-called Draped Bust design, by Robert Scot, which was first struck for circulation in 1798. The final circulation strikes released from the Philadelphia Mint were dated 1803, although the delivery of some of these pieces occurred in 1804. 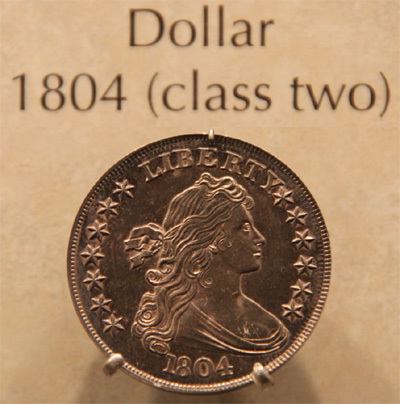 After the final delivery, production of silver dollars ceased (making the half dollar the highest denomination struck out of silver) and would not resume until the end of the 1830’s. Nonetheless, proof silver dollars dated 1804 are known, and they are generally accepted as regular product of the United States Mint. The reason for the existence of this enigmatic issue can be found in 19th century diplomacy at an international level. 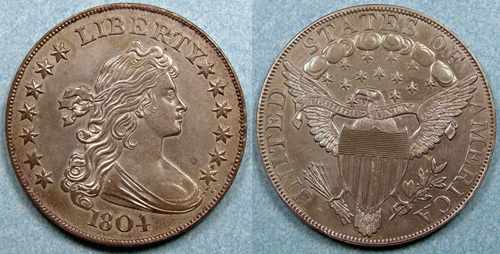 In 1834 Proof strikings were made of all United States coins in production at the time, from half cent to half eagle, for inclusion into special presentation sets to be given as diplomatic gifts. The eagle denomination (ten dollar gold piece), like the silver dollar, had not been struck since 1804. These coins, the highest denominations in both silver and gold, were deemed necessary for inclusion in a Proof set made for presentation purposes. The Mint had struck 1804 eagles, and the newly struck pieces were merely restrikes, as they are known today. However, most likely due to a simple oversight, it was forgotten that no 1804 dated silver dollars had been struck for circulation. In 1834, one 1804 dated obverse die was created, along with two reverse dies, slightly different in appearance to the dies used to strike 1798-1803 silver dollars of the same design. 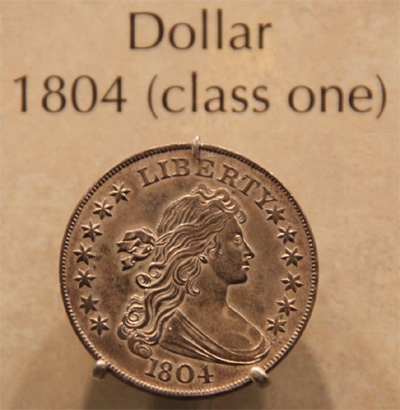 Through this unique set of circumstances, the 1804 Silver Dollar was created. There are many mysteries, some solved, some unsolved up to this day regarding the 1804 silver dollars. Compared to other issues from the Philadelphia Mint, facts are scarce. We know that the first batch of coins, known as “Class I”, included pieces that were struck for diplomatic purposes, although some also appear to have served other needs (collectors or influential men in Philadelphia). The date of striking for these pieces took place sometime after November 11, 1834. On that date two sets had been requested by the State Department. The total mintage is of Class I 1804 Silver Dollars is unknown, but at present eight individual examples have been identified, five of which are in private collections. One piece is in the Smithsonian collection (it was retained for the Mint collection immediately after striking), another is in the collection of the American Numismatic Association, and a third is in the Durham Western Heritage Museum in Omaha, Nebraska. These pieces were struck on planchets of the pre-1837 weight standard and have a lettered edge. These are all struck from a single reverse die which appears to have been destroyed after striking. Only a single specimen is known of the “Class II” group, currently in the Smithsonian Institution, making this class uncollectable. It is known to have been struck after 1857, most likely around 1858, as it is overstruck on a so-called “Shooting Thaler” of Bern, Switzerland, dated 1857. This piece has a plain edge, and is believed to have been the illegal product of Mint employee Theodore Eckfeldt (probably assisted by others), who might have struck as many as ten or fifteen 1804 Silver Dollars in the late 1850s. Eckfeldt had apparently sold them for $75 each, a healthy profit, it seems. When the existence of the coins was discovered, Mint Director James R. Snowden ordered them to be destroyed. Only the coin, which would eventually reside within the Smithsonian Institution collection managed to survive. It is believed that after Snowden discovered the illegal activities of Eckfeldt, the dies remained in Eckfeldt’s possession. Sometime around 1859, or perhaps as late as 1860, he managed to acquire dollar blanks from the coiners vault. These were of the new weight, and were meant to be used for mintage of regular Liberty Seated Silver Dollars. A minimum of six pieces were struck (the total number of pieces known today), which would be known as “Class III” specimens. To prevent easy discovery the edges of the coins were crudely lettered. Research has revealed that it might have been possible that some pieces were struck after Snowden had left the Mint, being part of a large number of restrikes made in the early 1870’s. This, however, remains unconfirmed. 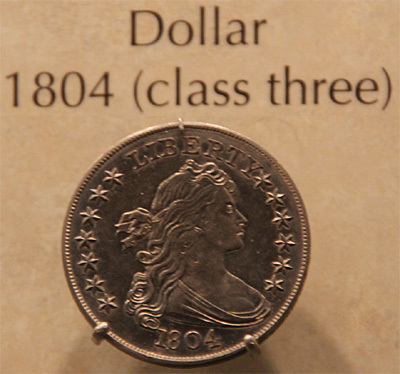 Three of the Class III 1804 Silver Dollars reside in museum collections, while three are currently owned by private collectors. Four of the six known examples display artificial wear; perhaps this was done to make it easier to sell them to collectors as Mint products. As there are only a total of fifteen genuine 1804 Silver Dollars known, it is not too difficult to determine which can be considered to be the finest known. However, to determine the value is much more difficult, especially due to the infrequent public offerings of this issue. A total of eight (roughly half of all known specimens) are currently held by private collectors; the majority being Class I pieces. When sold at public auction it appears that there is no noticeable difference in price between a Class I coin and a Class III coin. Both classes are considered to be genuine Mint products and are sold for large amounts. As can be expected from a coinage issue which was specifically produced for presentation purposes, a number of 1804 Silver Dollars have survived in remarkable condition. The finest of these is the so-called Watters-Childs specimen, graded by PCGS as PR-68, and is believed to be the coin that was presented to the Sultan of Muscat in 1834. This is the highest numerical grade which has ever been awarded to a 1804 Silver Dollar. The coin last sold in April 1999 for an amazing $4.14 million, a record price for this issue, and also one of the highest prices a United States coin has ever brought at public auction. The second finest Class I 1804 Silver Dollar is the coin which is part of the King of Siam set, the only complete 1804/1834 presentation set, still in existence (including wooden box) up to this day. It is believed that this set has privately traded for as much as $15 million. Other pieces are graded PR-65, PR-64 and PR-62, while a few impaired specimens also exist. One coin is graded VF-30 and appears to have been a pocket-piece of a wealthy individual. As previously mentioned, four of the six known Class III 1804 Silver Dollars show artificial wear. The other survivors are also in relatively low condition, having graded PR-63 and PR-60. One coin is graded by PCGS as PR-58 and last sold in April 2009 for $2.3 million. One coin is graded by NGC as PR-55 while the other two are graded EF-40.